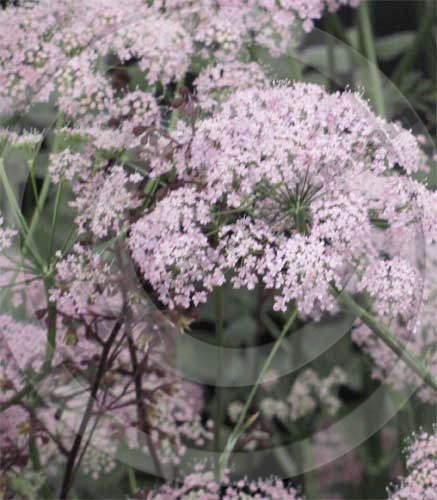 Our plant of the month for June is Pimpinella Major Rosea; a perennial plant for the herbaceous border. The delicate umbels of pink flowers are very similar to wild cow parsley and provide graceful movement and softness to planting schemes. Flowers in May and June are held high on stiff, wiry stems and are very attractive to bees and butterflies. The dark green leaves, which are long and finely cut, grow at the base of the plant, so that the airy flower heads are unhindered by foliage. Although Pimpinella prefers a sunny position in a freely draining soil, we have it quite happily growing in part shade. An excellent plant for the cut flower garden. Height & Spread: Will reach a eventual height of about 1m. and form a clump about 30 cm in diameter. Propagation: Divide congested plants in spring or autumn. Self seeds readily, so be sparing with the weeding and allow seedlings to develop before moving to a suitable location or sharing with friends. Special notes: Dislikes a waterlogged soil. Leave flower spikes for winter interest, food for the birds and and self-seeding. Hardy’s Cottage Garden Plants – Experts in perennial and cottage garden plants. Crocus – Where top designers get their plants.